Sister's Day in 2015 is on Sunday, the 2nd of August. Sister's Day in 2016 is on Sunday, the 7th of August. Sister's Day in 2017 is on Sunday, the 6th of August. Sister's Day in 2018 is on Sunday, the 5th of August. Sister's Day in 2019 is on Sunday, the 4th of August. Sister's Day in 2020 is on Sunday, the 2nd of August. Sister’s Day is celebrated on the first Sunday of August. We have Mother’s Day for our mother and we have Father’s Day for our father, but what about our sisters? 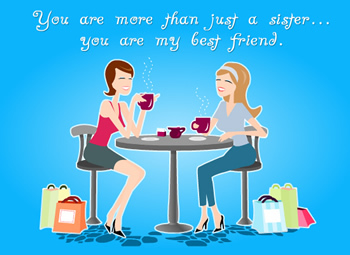 Hence, we have Sister’s Day. Sister’s Day is a day for celebrating your sister and for showing her your appreciation. Sister’s Day is celebrated on the first Sunday of August. Unlike Mother’s Day or Father’s Day, Sister’s Day is not a recognized federal holiday. However, that doesn’t stop people from celebrating it. After all, sisters must be celebrated. Did you know until the age of eleven, a person spends approximately over 30% of their spare time exclusively with their brothers and sisters? Hence, it can only reasonably be said that a sibling is one of the most important parts of a life. Imagine growing up without your sibling; the late night talks, the secrets shared and the secrets hidden from your Mom and Dad. Can’t do it, can you? Because without our siblings our lives would be so must more plain and boring. Thinking that, just a day to celebrate your sister hardly seems fair, doesn’t it?